Your resource for all things shoegaze and dream pop: Single + Video: Thud || Prime of Pride. Single + Video: Thud || Prime of Pride. 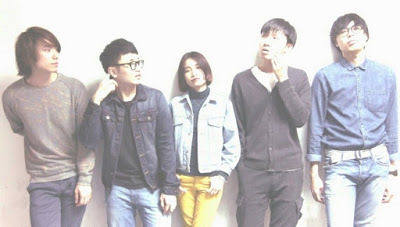 Thud is a Hong Kong quintet founded in 2012 by brothers Wang (bass) and Wai (drums). The project features Sky and Andy on guitars and Kim on vocals and synths. Their outstanding 2015 EP Floret can be acquired in digital and CD formats here. The band is working on their first full-length, of which we presume "Prime of Pride" is a foretaste. Check out Kim's graceful movements as she sings. Last year's charming clip for "Venture" from Floret stars Charlie the cat and Money the Shetland sheep dog. WTSH Interviews Rev Rev Rev. Tender Age on Tour Now || Save the Dates. New Video: Seafang || Motorcycle Song.